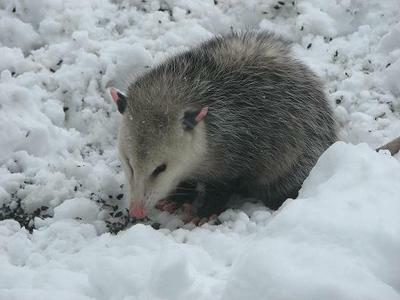 I have a possum and he's living in my backyard, although I've yet to determine where. Since October I've been hearing leaves rustling in our backyard from our tree. A few nights while sitting outside I noticed the tree shaking and moving. My husband tried several times to convince me it was the wind but I assure you on windless nights that tree would still shake. The first heavy snowfall came and I was sitting outside on our back porch, it was 11 pm. I heard a noise by the side of our garage and thought maybe it was a raccoon, then I heard a noise coming from under my husband's car which had just been turned off so the engine was still warm. A few minutes later, this creature steps out and literally gallantly and ever so calmly struts across my lawn, the motion sensor went off and I looked at him and he at me and we had a stare down for a few minutes. I couldn't take my gaze of him because he was adorable. Also I had never seen one before and I knew it wasn't a raccoon and he looked so cold and he went and hid under our wooden swing-set. I knew that was my tree creature and imagined he was looking for leaves to eat, or something so I went in and cut him some lettuce leaves. Two weeks later we saw him walking again in our backyard. A week after that again after a new snowfall, my husband opened our back door to look at the snow and there were tiny footprints right in front if our door, across our deck, and going back towards that very tree. I didn't know where he lives but I consider him our guardian.